A visitor to New Zealand can’t help noticing how many native ferns there are and how large they can get. It’s not an exaggeration to say that some grow as tall as trees, and people even refer to them as tree ferns. I photographed the ones in today’s picture, which were perhaps two or three times my height, in the shade of the forest at the Parry Kauri Park in Warkworth*, in the northern part of the North Island, on the afternoon of February 6. Kiwis (as the inhabitants of New Zealand are known) will recognize that as Waitangi Day, the national holiday, and in fact earlier in the day our hosts had taken us to attend the festivities at Waitangi itself. * New Zealand English generally drops an r that closes a syllable or that’s part of a syllable-final consonant cluster, so Warkworth sounds to American ears as if it’s Walkworth, which is as appropriate for the site of a nature park as the name Wordsworth is for a great poet. Thanks, Jude. I’d thought about pointing out the resemblance of these tree ferns to parasols but I decided to wait and see if a commenter made the comparison. You did, and in the very first comment. That’s a happy coincidence about the two Warkworths, both of which are worth a walk. Let’s hope you make it to the one in New Zealand as well. And I of where you’ve been. The only piece of Britain I’ve seen is London, so I’m long overdue for some other parts of the country. I’ve never experienced anything else like it. Highly recommended. Of all the good things I saw in Aotearoa, I’d say the tree ferns and the seacoast left the greatest impressions. As an artist, you’d find plenty of inspiration in both. I would indeed. If I were to be bitten by the travel bug, I’ve thought that would be the place I’d like to see. When I was out photographing in the Texas countryside yesterday I found some travel bugs. I’ll send you a few to put on your arm in hopes they’ll bite you. That’s quite a visual treat. Just what I felt in seeing it, Sally. It’s one of my favorites from the trip. Oh wow! That is just glorious 🙂 I just love tree ferns! I never knew about tree ferns till I went to New Zealand, but now I too find them glorious. Agreed: there’s nothing like being out in the bush (as New Zealanders say) with tree ferns around and especially above you. Others have also seen the resemblance to parasols and umbrellas—and now I’m wondering if anyone has ever made any of those that have tree fern patterns on them. I love this photo. I love taking photos of ferns looking up but the tree ferns aren’t as tall where I live. Up north the native bush is a lot more established as in centuries old. I loved looking up at tall tree ferns, as here, but I also liked being at a higher point and looking down into the concave canopies of tree ferns. You may not have as much native bush where you are as further north, but you’re fortunate that that region is within a day’s drive; I wish I could say the same. So enjoyed the picture! I’ve never seen such thing before. I hadn’t either, and I kept enjoying it whenever I encountered it. In fact I sought out areas of native bush so I could have more experiences of that type. These are great…like nature’s own kaleidoscopes. That’s still another take, one that neither I nor anyone else here seems to have imagined: a keleidoscope. Even though the ferns didn’t go round, I did somewhat as I composed my pictures. These ferns brought a complex architecture all their own. One look up into that canopy and I was hooked. I believe you’re still in Florida, so I interpret your last sentence as meaning close to your home in a metaphorical way (though maybe in a ferny way as well). Beautiful and other-worldly! Great photos. Let’s say these giant ferns have a knack for transmuting reality. That has to be the most beautiful image of a tree fern that I’ve ever seen. There’s so much order in the placement of the fronds… you surely combed them into precision before you took the photo?!! (Ja! I know better!) Seriously, you scored top marks! My friends in Mindo (Ecuador) have lots of tree ferns on their very wild 80-hectare property. I love standing beneath them and looking skyward. Your photo makes me want to play Georgia O’Keeffe and tip my brush to the Lawrence Tree. ¡ It took me hours and hours to arrange the forest just right for this picture ! I didn’t realize there are tree ferns in Ecuador. I’d only recently learned about the ones in New Zealand, but now there’s the possibility I’ll be able to travel to other places and find them there as well. To answer your last question, I think not all the comments about this post are in yet. I’m glad you were able to get back in and see the comments up to yours. One more has come in since then. Ha! You did a lovely job! You can tell that I looked up and snapped an image, unlike yours that’s precise and orderly! Yup, that’s a tree fern all right. The more the merrier, as far as I’m concerned. On my several visits to Mexico City from the late 1960s through the ’70s I stayed at the hotel where D.H. Lawrence used to stay, the Hotel Montecarlo at Uruguay, 69. Beautiful. Like twirling parasols. Or like the way the trees and sky whirl when you turn round and round until you are too giddy to stay upright. Were you upright when you took this photo? I was standing and looking more or less straight up with the camera’s viewfinder to my eye. In that posture I did rotate some to compose the picture, but nowhere near enough to get giddy, except figuratively from the excitement of seeing these tree ferns overhead. What a sight it was! I have seen trees shot like this many times but here the tree ferns are so different you have created a very unique shot! You make a good point: I’ve seen upward shots of trees many times too, but the different arrangement of the foliage atop the ferns gives the image quite a different feel. By the way, bush is the term New Zealanders use for what many of the rest of us call a forest. I second the comment and your response above–the shot from underneath that arrangement of foliage makes for a great photograph. I look forward to your continued NZ reportage. Looks like it was a wonderful trip. Hi, Susan. Yes, the view looking up into those ferny parasols was great, different from anything I remember. NZ made for a wonderful trip, that’s for sure, as you’ll continue to see in the weeks ahead. I’m very much looking forward to the next installments! I won’t stall those installments, Susan. Just wonderful, Steve. There’s nothing quite like a chance to walk the forest floor and gaze up to study these prehistoric wonders. The feeling that one has been magically miniaturized is nearly overpowering. You can appreciate this, Gary, having experienced it yourself. New Zealand travel posters, brochures, and tourist websites should have pictures like this to entice people to visit. Esta fotografía es realmente maravillosa. Gracias. Es porque el sitio es maravilloso. The combination of sunlight, sky, and the beautifully symmetric circles make me think of the Sufi dervishes. While the ferns can’t spin, I can imagine spinning beneath them in utter delight. I hadn’t known they existed either, and you’re right that it sounds like a contradiction for anyone used to the little ferns we have in Texas. Of course I’ll encourage you to follow your impulse and go to New Zealand, though I learned from Lisa’s comment above that there are tree ferns in Ecuador, which is closer. Better yet, you should visit both places. To parasols, umbrellas, and kaleidoscopes, your imagination has now added Sufi dervishes. So many things that make the world go round. You can say that again, Nora. 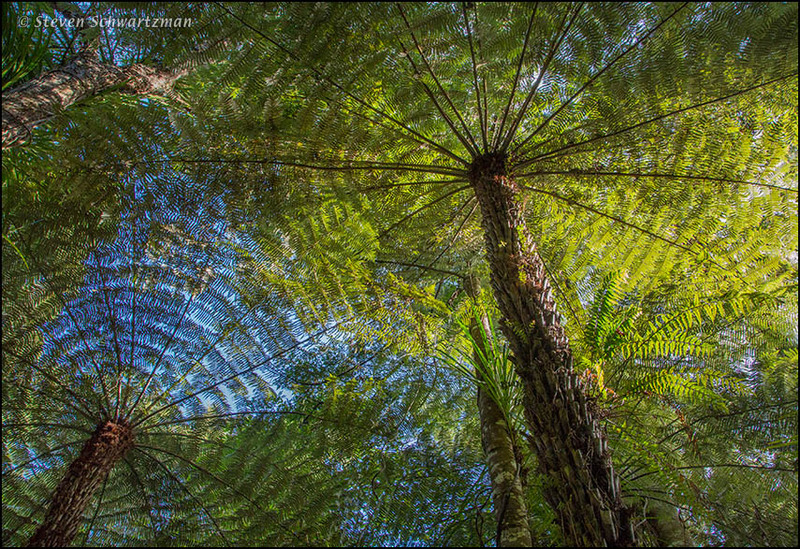 Joanna spent a semester in Tasmania when she was in College … to this day she talks about the tree ferns! You’ve done well with the natural geometry here. That’s an apt phrase: natural geometry. I can understand, even after just my few weeks in New Zealand, why Joanna would keep talking about tree ferns all these years later.